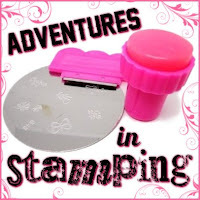 I had a couple different ideas for today's stamping theme. In the end I went with a simple design. I wanted something bright and summery and I think I achieved that! The thing that really makes my design is the base polish! I went with two Milani textures, Purple Streak and Spoiled in Fuchsia. These two polishes are exactly what I was looking for! Bright and summery! I added my French manicure using Black Swift and BM219. I really like how this design turned out. Of course there is a little bit of an 80s feel to it but I think its cool! Simple but fun! So cute, so it works, even on texture nails!